Well, the 2011 season is in the books, and by almost all accounts it was a resounding success. Eleven wins, beat Notre Dame in the first ever night game at the Big House, beat Ohio...finally, beat Virginia Tech in overtime in the Sugar Bowl – hard to look back, even with the losses to Sparty and Iowa on the road, and remember this season, Brady Hoke's first, and team 132, as anything other than memorable. But 2011 is sooo last year. We can only sit back and enjoy past accomplishments for so long. It's also January and we don't go gaga over recruiting, so we need something to talk about. So what's going on for 2012? What can we look forward to? Who's leaving? What incoming and red-shirt freshman will make an immediate impact? How does the schedule look? This series of posts will attempt to address each one of these topics. First up, the schedule, after the break. The first thing that jumps out at you when you look at the schedule is the opener against the defending national champion Alabama Crimson Tide at Cowboys Stadium in Arlington, TX. You should feel a slight twitch in your neck or a noticeable pain in your gut when you see that. This is normal. Go with it. I'll just say that if you want to be the best you need to play the best. It's cliche, but it's true. Let's just say that we beat the Tide (it is January after all), what a shot to the arm for the 2012 season right off the bat that would be. I'll predict we begin the season ranked somewhere around #13 to #16, and of course Bama should be the obligatory #1 team...but could be as low as #3. Should we win (again, bear with me), our ranking could be top 6 or 7 going into the home opener the next week against Air Force. I'm sure the awkward and ugly win against VT in the Sugar Bowl and the close victory against an orphaned Ohio team to end the season helped us, but in the eyes of pollsters, didn't exactly sell Michigan as being "back". Beating Bama would go a long way in improving Michigan's image nationally. I'd go as far to say that just a close loss would improve our stock. But in 2012, Bama will be slightly more beatable. Three very talented underclassmen have decided to turn pro for 2012. All-American's Trent Richardson (RB), Dre Kirkpatrick (CB) and Dont'a Hightower (LB) have declared for the NFL draft. All-in-all, Bama will need to replace 6 starters on offense and 7 on defense. But don't feel too sorry for them, they can do it with that vaunted SEC depth that oversigning offers you. After the trip to Texas to open the season, we welcome the Air Force Academy to the Big House. I'm really pumped to be playing a service academy. I liked the addition to the schedule when it was announced last year, and I like it still. Following that game, we welcome UMass back to the Big House for a $650,000 payday. When they first visited the Big House back in 2010, they were a lowly FCS school, but still played strong and gave Michigan a scare. But now, they're in the MAC. Don't worry sports fans, even though there are no directional Michigan schools on the slate this season, there will be some #MACtion in the Big House for 2012! After a brief a two-game home stint, we travel to South Bend for what I can only imagine will be a very close game that will end in pure heartbreak for the Irish. 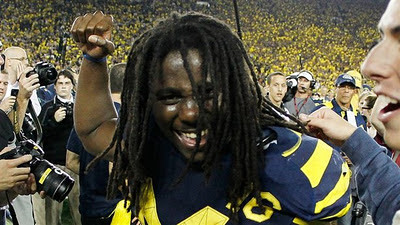 The last thing Brian Kelly and his team needed to hear was that Denard was going to be back for his senior year. No team has been Denard-ed more than Notre Dame. In two games, Shoelace has accumulated 948 of total offense against the Irish. After that, a bye week and then it's on to the B1G. In what I can only describe as "less than ideal", all of our division games are back-to-back with no off-weeks. The nice thing is, 3 of the 5 are at home. Especially two of the tougher opponents who's venue you never want to go to, Iowa and Michigan State, whom we lost on the road in 2011. The trip to Lincoln will be interesting. But what will really help us is knowing that maybe our best and most complete game last year was against the Huskers in the Big House. Northwestern at home and Minnesota on the road should be pushovers. Purdue in West Lafayette and then Illinois at home to start B1G play, after a bye-week, is actually a great way to dive into the conference slate. For as tough as our schedule looks on paper, these two games falling where they do on the schedule is, I think, a blessing. And then of course, the Buckeyes on the road to wrap up the season after 5-straight Legends division games. Hard to argue that playing us is going to be the biggest game for Buckeyes next year. Without the possibility of going to the B1G Championship game or a bowl game, there's not much else for Ohio to play for besides just pride. 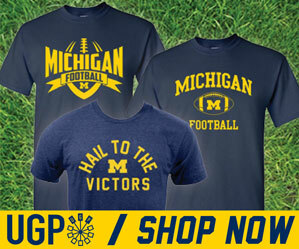 Expect to see tons of it on display in CBus as Urban Meyer gets his troops ready for #Team133. All-in-all, I think the 2012 schedule breaks down pretty nicely considering how daunting it looks on paper. They key to success for us next year is going to be how we're going to fill the gaps of some of the seniors who left. In our next look ahead to 2012, we'll address just that.